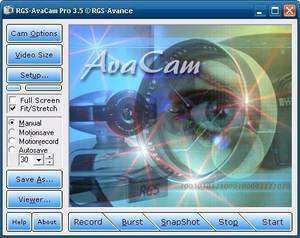 RGS-AvaCam is a free program for capturing screenshots from your webcam or other camera devices connected to your PC and recognized by the program. It features a user-friendly interface and takes up little in the way of system resources. It also features a few configuration options and can record videos in AVI format. The layout here is clean and simple which basically means you can perform many of RGS-AvaCam's features in a timely and efficient manner. Version 3.6.5 is a freeware program which does not have restrictions and it's free so it doesn't cost anything. For security reasons, you should also check out the RGS-AvaCam download at LO4D.com which includes virus and malware tests. Additional screenshots of this application download may be available, too.